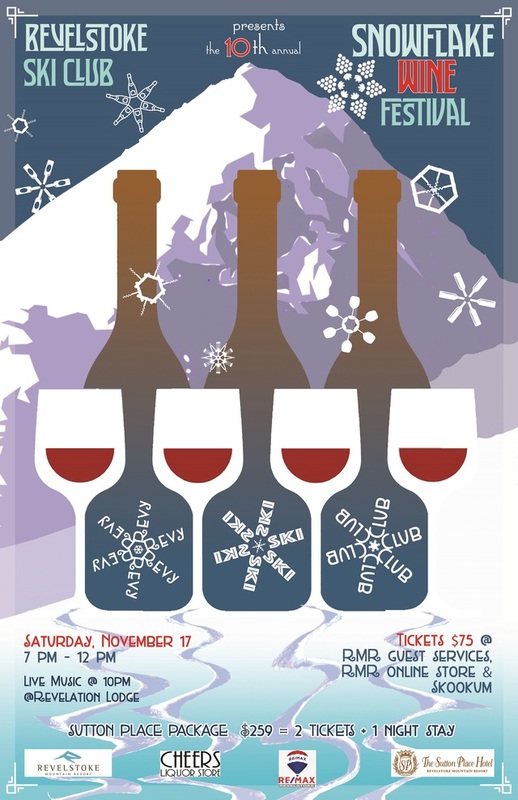 Don't miss the 10th Annual Snowflake Wine Fest to benefit the Revelstoke Ski Club youth programs held at Revelstoke Mountain Resort's Revelation Lodge. Join us at this social event with over 25 tasting tables featuring Okanagan's best wineries, breweries and distilleries. There will be delicious food, amazing silent auction with your favorite items, and an after party featuring energetic dance music by DJ SPANDA - an evening of afro, funk and groove electrics. Tickets are now on sale at Skookum Cycle & Ski Revelstoke. $75.00 each cash only. Purchase tickets online through the Revelstoke Mountain Resort online store, search under events or use the Book Now button on the Snowflake Wine Fest Facebook page.